In the middle ground is the south Side of the building housing the 19 delousing gas chambers under construction in the winter of 1942/43. 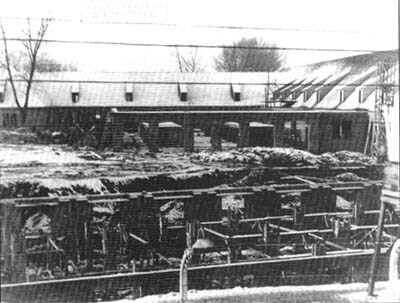 In the foreground the foundations of the main laundry. (Photo taken from Block 26 of the main camp). In the middle ground is the south side of the delousing installation, showing its position between the north wing housing the baths, the central section for reception and the south wing housing the laundry which is under construction. (Photo taken from Block 26 of the main camp). 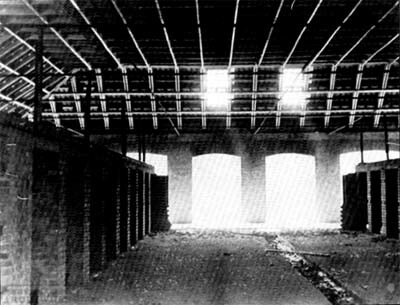 Interior view of the delousing installation with the row of openings on the “dirty” side of the gas chambers, spring/summer 1943. The steel framework at a height of 2.50m is perfectly visible. The southern internal wall with four windows, separating the “clean” and “dirty” sides is under construction. "Blausäure - Entlausungsanlage - / prussic acid delousing installation” no longer appears on the final drawings 1361 and 1391. However, there is no doubt about the identity of the agent used.. 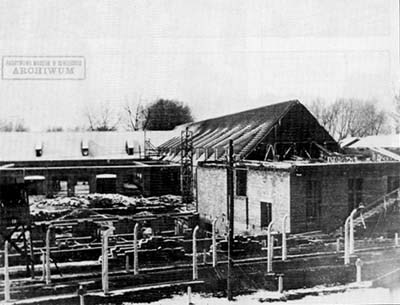 The presence of a staircase going up towards the roof space would explain the purpose of the steel frame, which would have supported a floor carrying the equipment necessary for the functioning of the gas chambers. 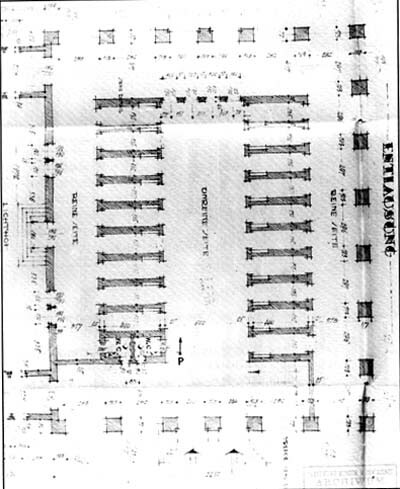 As compared with drawing 916, where the delousing installation was a direct extension of the reception building, drawing 1361 shows it to be separated from it by a distance of 6 meters, access being by two corridors (one clean and one dirty). The SS bathroom and the place from which they monitored the operations (showers of arrivals) are only 10 to 15 meters from the gas chambers.